It's that time of year again. I'm offering the perfect holiday gift, discount gift certificates for fishing charters and ecology tours aboard Fish'n4life charters. Order your gift certificate now for you or for a gift that can be scheduled anytime within the next year. Receive a 10% discount and avoid any increased rates for the 2015 season. We can send your gift certificate via email or USPS. 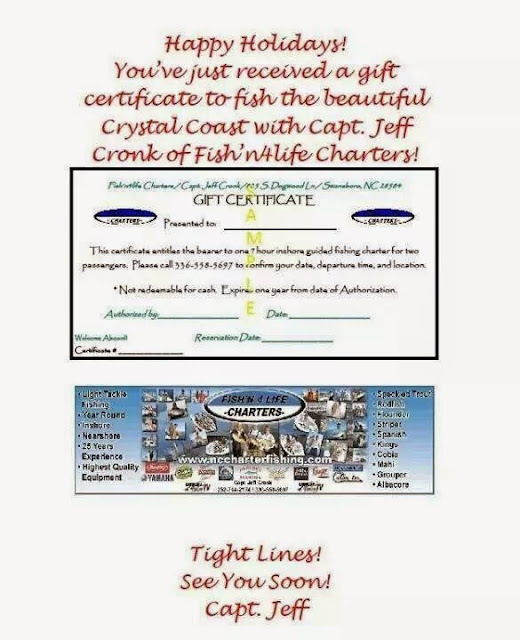 Call captain jeff cronk at 336 558 5697 or email at jcronk@ec.rr.com to order your gift certificate today.